What are the Different Nursing Ranks? If you’re interested in a career in nursing, there are several different nursing ranks that you may want to consider. Each of these requires a different level of education and experience to become licensed to practice as a nurse. Read on to learn more about these professional ranks within the nursing profession. A licensed practical nurse is a professional who performs basic nursing duties under the supervision of a registered nurse (RN). These duties include administering basic patient care, helping them bathe, dress, and eat, and recording notes about their progress. LPNs typically complete a one-year education program that includes both clinical experience and classroom learning, and must pass a test to become licensed by the state. According to the U.S. Bureau of Labor Statistics, LPNs make an average annual salary of $41,540 per year. This is also a fast-growing niche within the nursing profession, with 182,900 new jobs projected to be created by 2022. Registered nurses are responsible for coordinating patient care in hospitals, nursing homes, and other medical settings. Their duties include providing treatment as well as education about this treatment to patients and their family members. 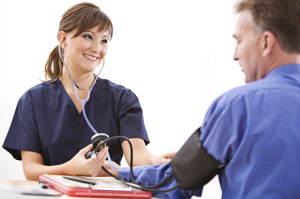 Many RNs have an associate’s degree, although some go on to earn a Bachelor’s of Science in Nursing (BSN). They must also become licensed in their state of practice by passing a test and completing a certain number of clinical education hours. Registered nurses earn an average annual salary of $65,470 per year according to the Bureau of Labor Statistics. This is great news if you’re interested in this profession as more than half a million new jobs are expected to be created by 2022. An APRN is a nurse who has completed a master’s degree program and is licensed to practice medicine under the supervision of a physician. This category of nurses includes nurse practitioners, who see and care for patients; nurse anesthetists, who administer anesthesia for surgical procedures; and nurse midwives, who care for pregnant women and deliver babies. In many cases, nurses in these roles are first required to complete an RN program and spend time working as a nurse before entering the APRN master’s program. They must also be licensed in their state of practice and area of expertise. While APRN salaries vary by specialty, they average about $96,460 per year. This career is expected to grow by 31 percent by 2022, with 47,600 new jobs projected, according to the Bureau of Labor Statistics. The nursing profession as a whole is an excellent field if you want to help people and work in a role with career growth and stability. Choosing between the different nursing ranks largely depends on your area of interest, your ultimate career goals, and the level of education to which you’re willing to commit.